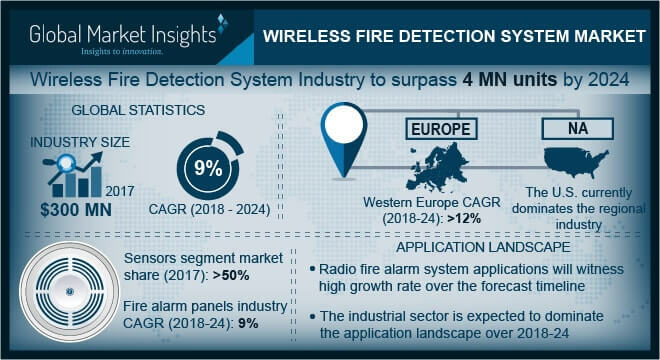 Wireless Fire Detection System Market size is set to exceed 4 million units by 2024; according to a new research report by Global Market Insights, Inc. The growth of the wireless fire detection system market can be attributed to the increasing emphasis on preserving the building design, reducing asbestos, and improving the aesthetics coupled with the ease-of-installation of such systems. The establishment of various standard sand codes for radio fire alarm systems, such as the European Union’s directive EN54 Part 25, outlining the specific requirements and laboratory tests for components using radio links in a wireless fire detection system market helps to positively boost their adoption as they help in enhancing the credibility of the solution for end-users. The stringent government regulations and mandates are expected to offer a favorable boost for the installation of fire detection systems. However, the lack of acceptance of radio fire alarm systems owing to the high cost of devices and the perception of low reliability given the vulnerability of wireless system infrastructure may pose a threat for the market growth of wireless fire detection system market over the forecast period. In a wireless infrastructure, various sensors and detectors communicate with the fire alarm panels through radio signals. The increase in the adoption of addressable fire alarm panels can be attributed to as the key driver for the adoption of wireless sensor technology. The market growth has gained momentum over the past few years owing to the benefits of radio fire alarm systems such as visual and auditory confirmation in cases of emergency and elimination of false alerts by means of a flexible system design. The high cost of wireless control panels may limit the market growth of the wireless fire detection system market over a short term; however, the rise in the number of regional market players offering competitive prices may boost their adoption across such regions. The growing trend of infrastructure development in developing regions including India, Brazil, and Thailand coupled with new construction activities, tightening of fire safety and security norms, and proliferation of wireless connectivity is expected to favorably boost the demand for wireless fire detection system market over the forecast period in such regions. The rise in the adoption of radio fire alarm systems in developing regions offers a stupendous potential for market growth over the next six years. In addition, the need for enhanced safety and security features that match the laid-out compliances and protocols is expected to drive wireless fire detection system market growth over the mature markets of Europe and North America. The global wireless fire detection system market is factored by trends such as reduction in cabling, swift installation, and minimal structural alterations making the solution viable for retrofit applications, particularly in schools, offices or industrial applications, where downtime disruption is not feasible. The cost and time associated with the installation of wireless fire system are significantly low since there are no cabling requirements. The growing demand for radio fire alarm systems can be attributed to their ease-of-installation, which serves as an appealing feature for most system installers. The wireless fire detection system market can also be integrated into radio loop modules with existing addressable wired systems, making the solution lucrative for hybrid and retrofit applications. Adoption of wireless fire detection system market across residential applications in the U.S. is expected to boost demand for the solution over the forecast period. The growing trend of smart homes and reduction in price of smart home automation devices is expected to drive down the cost of residential wireless fire detection system market over the forecast period. In Canada, the cost remains high owing to lack of established regional players in the region. With continuous improvements in radio fire alarm systems, these solutions are able to offer advanced features such as temporary fire alarms in cases of accidental or deliberate activation of call points and adaptability of the system to respond to real and genuine emergencies. Issues, such as radio signal interference, can be minimized by an automatic change of frequencies as needed, leading to reduced risks of system failures and improving the overall reliability. The global rise in the demand for wireless fire detection system market in industrial and commercial applications has forced several established layers to expand their expertise in the segment through product innovations or strategic acquisitions.